Harvard the landlord in Allston & Harvard the landlord in Cambridge - Which would you prefer? As we know too well, in Allston and Brighton Harvard keeps buying up property and has proven itself incapable of finding tenants that will create any significant, permanent jobs or any needed neighborhood services. What a difference a mile makes! As the current issue of Boston Magazine reports, Harvard has leased space in a building and paid rent while the space sat empty while looking for a grocery store that would open there. This addition to Harvard Sq will bring a real benefit to the Harvard Sq community - unlike the Western Ave wasteland Harvard has given us. Harvard University owns 30 storefronts in Harvard Square, and almost all are leased to independent businesses. But this winter, when a new grocer opens at the corner of Brattle and Church streets, Harvard will have exerted an unusual influence over the area—by acting as landlord in someone else’s building. While the school may have a bad rep for gobbling up and controlling land, the market is a welcome thing: People there have been clamoring for one since the 102-year-old Sage’s Market closed in 2000, only to be replaced by a Sprint PCS store. After Sprint left in 2005, Harvard worried the space again would be snatched up by a chain. So it leased it, paying rent on the vacant storefront while searching for a market to sublease to. New Haven grocer (and Tufts grad) Peter Whang signed on in June, and plans to open shop soon. On Wednesday, October 3 at 2:00 on the 9th floor of City Hall, the Board of the Boston Redevelopment Authority will vote on the Harvard Science Complex project proposed for Western Ave in Allston. Please join members of the Allston/Brighton community to tell the BRA that a Final Project Impact Report must be required and the BRA should not waive further review of the project. "I encourage the BRA Board to send this back to Harvard for a "do-over" -- no fouls, no penalties. I think the City, if it truly cares about this neighborhood and getting this first phase of a 20+-year plan right, should follow its own rules and ask for a resubmission." "The Science Complex size is too tall for the site and unjustifiably violates the agreements of the North Allston Strategic Framework for planning"
"A project of this size and scope deserves a review process that ends with a consensus opinion as to the process having been fair in its treatment of the community's concerns. That is not yet the case." "Our community has endured over the last 13 year Harvard's grab for more and more land that has resulted in shuttered businesses all along Western Ave. As part of approving the Science Complex development and before the next IMP is approved the BRA must insist that Harvard immediately start a Commercial District master plan process for their holdings along Western Ave and the Holton St corridor"
"We are concerned that the proposed transit network may be insufficient to adequately serve the Science Complex"
"Many of the pertinent issues raised by the community have not yet been addressed adequately by Harvard"
"It would be shortsighted to move forward with such a large development without having a broader transportation and public space plan"
"I am opposed to the lack of attention and collaboration between Harvard and the community in adequately addressing community benefits, open space and public access to the river, traffic mitigation plans, and building heights. It is evident that that there are far too many unanswered or inadequately answered questions concerning the impact of Harvard's development plans on the community. Yet, despite this, and despite repeated requests for extensions, it appears as it all is poised for the community to be steamrolled by Harvard's plans." "The sheer size of the development will dwarf our neighborhood"
The complete set of comments submitted about the Science Complex and the related Master Plan Amendment are available online using these links. (note that many Amendment comments relate to an art building proposal that has since been withdrawn). I look forward to seeing you on the 3rd. As development starts on Fan Pier, the City and others are rightly proud of the significant planning done before construction started. The Fort Point District 100 Acres Master Plan and South Boston Waterfront Public Realm Plan are two of the impressive planning documents guiding the development of the City's second-largest ongoing development. 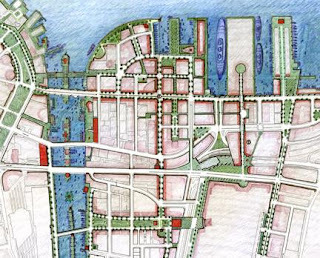 "The whole Seaport public realm plan was probably the best piece of planning the city has ever done," said Kyle B. Warwick, managing director of Jones Lang LaSalle. This attention to planning sits in stark contrast to the award winning plan for our neighborhood that the BRA and Harvard remind us isn't actually a plan. Its is a 'framework for planning' that 'shouldn't be interpreted literally', they tell us. Not only does South Boston get a plan that is actually being used to guide development, the projects that are being built will benefit that neighborhood in so many different ways. Far from its gritty industrial beginnings, developer Joseph Fallon said, Fan Pier will now be a place not only to work, live, and shop, but also to have fun. "You can come to sail," said Fallon. "You can come fly a kite. If your spouse tells you to go fly a kite, come to Fan Pier." Our plan, the North Allston Strategic Framework, promised that places to live, shop, and have fun would accompany Harvard's expansion. There isn't much of any of that in the 8 acres of the Science Complex, but soon we may be shifting our focus to Harvard's Master Plan. Our challenge will be to do better than a suburban office park/campus on the east side of Western Ave while Western Ave west of North Harvard St is left to further rot away. Fan Pier is setting a high standard for urban design. Will Harvard and the City decide to live up to that standard in Allston? Tim Schofield is a veteran and homeowner in Allston-Brighton. He is also the Co-Chair of the Brighton-Allston Bicentennial Committee and owns a law-practice in Brighton Center. He finished 3rd in the Allston-Brighton city council preliminary election on Tuesday. Something in the neighborhood of 45,000 people who could have voted in the election on Tuesday did not cast a vote. So while Mark Ciommo topped the ticket with 31% of the vote (1,406 votes), he actually received votes from only 3% of the 50,000 possible voters! There are so many relatively simple ways that more could be done to help people learn about elections and make the relevant information more accessible. The city puts a variety of pamphlets in our water and real estate tax bills. How about one with information about upcoming elections? A few times a year the city hires people to go door to door to every home in city distributing information about winter parking rules (that don't ever seem enforced) and pickup of leaves and yard waste for composting. How about a reminder flyer the day of the election? As I mentioned in a posting last week, the city's election website could be so much better. At the very least it could be very clear about when elections are happening, how to register to vote, who is eligible to vote (Dem/Rep), and have links to the websites of each candidate. The WallUSA bus shelters all over the city are natural places to inform people about important civic events. These are highly visible billboards on city property that, for a few days a year, could publicize elections instead of the usual advertisements. As tax-exempt universities expand in Allston and Brighton and our property taxes keep going up, people have been asking if all activities of these huge institutions should be exempt from taxes. Most people seem to agree that classrooms, laboratories, and other space directly related to education should continue to be exempt from taxes, but why should the tax treatment of an apartment building be different because it is owned by Boston University instead of The Hamilton Company? With the recent news about Harvard's $35 billion endowment and the growth of university endowments across the country, the Senate is asking if it makes sense for these endowments to grow free from taxes (as opposed to the taxes on capital gains that you and I pay on our relatively minuscule savings). “The taxpayers subsidize university endowments in two ways. One, the taxpayer’s donation to the endowment is tax deductible. Two, the endowment itself isn’t taxed. So big tax breaks make the big endowments possible, and taxpayers at large pay for those tax breaks,” Republican Sen. Charles Grassley of Iowa said in a statement. Our Senator John Kerry is a member of the Finance Committee. You can email your thoughts on this subject to him using this form on his website. "Harvard has made Western Ave look like downtown Lynn ten years ago"
The event will be at the Elks Lodge, 326 Washington St. Meet the candidates at 7 and the forum starts at 7:30. The existing Harvard-Allston Task Force, supplemented with a limited number of additional representatives to assist in the state's review of Master Plan impacts, serve the function of the CAC. To nominate yourself of someone else to be on the CAC, address your email to Secretary Ian Bowles and sent it to briony.angus@state.ma.us by October 9. It can only help to ask your State Rep and Senator to nominate you as well. Harvard has made a voluntary commitment to provide the CAC with financial resources to assist the CAC in obtaining third-party peer review of technical materials developed by the proponent that pertain to the issues of transportation, energy, and air quality. The polls are open today from 7am to 8pm. You can use this form to find the location of your voting location. The Harvard Crimson has this article in today's edition about the election. Over on the Brighton Centered blog, Mike Pahre has written an entry about my support for Alex Selvig and some emails sent over the weekend that I and many other people consider inappropriate, unfortunate, and regrettable. Publishing and analyzing the campaign finance reports of the City Council candidates was done to increase openness and transparency of the election process and to give the voters of Allston and Brighton insight into whose money the candidates are taking in their quest to become our City Councilor. Transparency and openness have been hallmarks of Alex's campaign and when he published his finance reports on his website and called on the other candidates to do the same, I saw a candidate that I would be proud to have represent me on the City Council and who would work hard to bring similar openness to many of the things that happen at City Hall that affect us but that are too often kept far from the public eye. When I read the "BoughtPolitician" emails sent over the weekend I didn't think the tone was at all appropriate. In general, this campaign has avoided nastiness, name calling, or other things that too often happen in politics. I was dismayed when I found out that Alex might have been involved with them. Is this in the same league as the anti-Fred Thompson website recently created by people related to the Romney campaign? Or the Swift Boating of John Kerry? Or the circumstances that led to Joe Biden abandoning his bid for President in 1988? Regardless, I think the author of these emails could have found a better way to voice the concern that he or she shares with many others in the community about who is funding the Hanlon and Schofield campaigns. Will this affect the outcome of tomorrow's election? I doubt it. If Alex (as a first time candidate) beats any of the 4 remaining candidates (who have all run for elected office in Allston/Brighton before) I think it will be a surprise to many, including myself. Six months ago, how many people knew the name Alex Selvig? After all this, I still am supporting Alex. His lawn sign is still in my front yard and I look forward to seeing many of my neighbors tomorrow voting at the Honan Library when I will ask you to consider voting for Alex. There were times when I was horrified by things that Bill Clinton did that were much worse than a few derogatory emails. But on the whole I think he was a pretty good president and I think Alex would be a very good City Councilor if we are fortunate enough to have him represent us. Do lawyers give tons of money to all the candidates? An anonymous reader posted a comment writing "Lawyers have given tons of money to all of the candidates- this is a non-story." It is worth noting that there are contributors to all campaigns who did not list their occupation and the occupation/employer information is not independently verified so it may be less than completely inaccurate. Finally, like everyone else, there are lawyers doing great work for society and lawyers who more motivated by money and power than the impact of their efforts. A politician who stands quietly in the back of the room at our neighborhood meetings and avoids taking a clear stand on key issues is not what Allston and Brighton need. A wide range of challenges face our community and the real estate developers, universities, and others who seek to profit from opportunities in our community are not shy about using their money and influence to get what is best for them. We need a City Councilor whose allegiance and commitment to Allston and Brighton is crystal clear. Someone who is going to stand up for the residents as much or more than the lawyers and hired guns stand up for their clients. Alex Selvig is the candidate whose experience, skills, intelligence, personality, and determination make him worthy of support in Tuesday's election. He will never worry about the fate of the CITGO sign or support zoning variances and licenses that are opposed by the community. He will bring creativity and passion to the City Council on behalf of his constituents in Allston and Brighton. I hope everyone reading this who lives in Allston and Brighton will vote on Tuesday and please consider voting for Alex Selvig. If you want a liquor license or zoning variance you have a good chance of getting what you want if you have a lawyer from the firm of McDermott, Quilty, and Miller. If you are Tim Schofield raising money for your City Council campaign, apparently you also go to McDermott, Quilty, and Miller. Former councilor Michael McCormack, a lawyer and lobbyist, said people who do business with the city have a good reason for giving. "These are people who have an interest in seeing the city economically strong and sound," he said. "They also want to be in a position to pick up the phone and call someone if they have a problem. Sometimes the operative word is access." "If you're the head of a significant company that does a significant amount of business in the city you want to know that you can pick up the phone and call the City Council president. Someone will listen and help." The Schofield campaign did not respond to an email seeking comment on this issue. In the Globe's endorsement of Tim Schofield for City Council, the editorial board commented that "Schofield has proven his commitment by leading the effort to build a heritage museum to honor the neighborhood's bicentennial anniversary." I am writing in response to the Globe editorial entitled “For council in Allston-Brighton”. I do not believe the editorial told the whole story. I know Mark Ciommo and I worked closely with him on the creation of the new Brighton-Allston Heritage Museum. Mark immediately embraced the vision for the new Brighton-Allston Heritage Museum. Working cooperatively with the City, Mark’s involvement was essential during the planning, organizing, and implementation and we would not have met our goal of opening on the Bicentennial founding date of February 24th without his help. Mark has strong roots in the community. The breadth and depth of his commitment to and knowledge of Allston-Brighton through his work with seniors, youth and families, is unsurpassed by any other candidate in the race for Allston-Brighton District City Council. That is why I am voting for Mark Ciommo on September 25th. Tim Schofield, Mark Ciommo (the executive director of the Veronica Smith Senior Center which houses the museum in its basement), John Quatrale, Bill Marchione (president of the Brighton Allston Historical Society and a contributor to the Schofield campaign), and many others certainly deserve credit. Whether or not Tim "led the effort" is a question that I can't answer. When I went down North Harvard St at 7:00 last night (1/2 hour before kickoff) the situation seemed quite good from a neighborhood perspective - minimal traffic delays and fans around the stadium not creating any problems. I have no idea where Harvard parked all the cars, and just a few days ago Harvard predicted that attendance at the game might reach 10,000 and they ended up with almost twice that. It will be interesting to hear from people who live on Franklin St, North Harvard, Rena, Hopedale, and elsewhere to see how they were or weren't impacted by pre- or post-game activities. $500 of Rosie Hanlon's campaign contributions came from Leonard Samia. If you live in Allston or Brighton, chances are pretty good that he owns rental property near you. If there is any truth to these stories in the Boston Globe, this might be one check that Rosie should consider returning. "According to former residents, housing advocates, and legal aid attorneys in Louisiana, Samia took advantage of the chaos that consumed New Orleans after the hurricane -- a lawless time when police, courts, and social service agencies were overwhelmed with emergencies -- to force out tenants. The tenants were among the city's most vulnerable residents, their lawyers said, lacking the money and know-how to fight the eviction pressure they faced." "As Samia's real estate empire grew, he began to attract the attention of the city's housing, building, and code enforcement officials. In the past five years, he has repeatedly been hit with citations by the city's Inspectional Services Department for a litany of code and maintenance violations, including improper trash storage, unshoveled snow, and unlicensed flammable substances. The 20 criminal cases that have been brought against Samia in Boston Housing Court since 1999 reflect more serious safety violations, such as uncertified fire escapes and unmaintained smoke detectors." The Hanlon campaign did not respond to my inquiry about this Leonard Samia contribution. Only two candidates received money from labor unions. Note: Other candidates received contributions from union employees, but these contributions were listed as being made by private citizens, not the labor unions themselves. In partnership with the Brighton Centered blog, the campaign finance reports for the 5 city council candidates are now online at the AllstonBrighton2006 website. There are a bunch of ways to look at this data - here are some of the recognizable names that appear in the donor lists. At the Boston Landmarks Commission hearing on Tuesday, September 25 in room 900 of City Hall there will be a hearing about the proposed demolition of 465-475 Cambridge St. The meeting starts at 5:30 and this case is scheduled for 6:30. A demolition delay hearing is required to discuss alternatives to demolition for any building in Boston more than 50 years old. For more information call 617-635-3850. "He's a creative implementer and a respected, able manager," Menino said. "He's the right guy for the time." Development on the South Boston Waterfront and Harvard's expansion to Allston will be top priorities, Menino said. Less than a week before we go to the polls to narrow the field to 2 finalists to be our next City Councilor and its too bad that the Election Department of the City of Boston website, and for that matter, www.cityofboston.gov do so little to inform people about the upcoming election. If you feel like running or walking for a good local cause, visit the Brian J. Honan Charitable Fund website for more information about the 4th annual Brian Honan 5K. The state said yesterday that Harvard University has committed to cap greenhouse gas emissions at its Allston science complex beyond national requirements, but officials sparked criticism from some environmental and community groups by exempting the school from an environmental-impact review. "The people of the Commonwealth shouldn't be put in a position where they are accepting lax environmental review of major projects that are being played off against some other nominal commitment," said Chris Kilian, a vice president of the Conservation Law Foundation. Under the most expensive proposal, Allston and Weston tolls could rise to as much as $1.75 on Jan. 1, an increase of 75 cents. Tolls could double to $6 at the Ted Williams and Sumner tunnels for drivers who do not use a Fast Lane pass. Harvard's actions haven't said much about their commitment to Allston, but here is the latest nice words from Cambridge about Harvard's Allston expansion. Within months, we hope to break ground on the first science complex in Allston – a milestone in our larger efforts to shape new spaces hospitable to interdisciplinary collaboration, and to extend our campus in ways that will brighten our academic future, benefit the surrounding community, and reinforce our commitment to sustainability. As we intensify our planning, it seems to me essential that we come to view Allston as a shared opportunity – an investment not merely in one school or another, in this program or that one, but in the common future of an institution whose vitality depends on new intellectual connections, new spaces in which to work and live, new ways of engaging each other and our neighbors. While we are deeply involved in discussions of plans for Harvard’s presence in Allston, we must remember that these plans take root in aspirations for Harvard more generally. They must grow out of the needs and hopes we define for ourselves as schools and programs, faculty and students, teachers and learners – not just in our new precincts, but in our traditional ones. And we must explore as well the opportunities that Harvard’s changing landscape offers to build strengthened relations with our neighbors both in Cambridge and Boston. Captain King, District 14 - Introduction of new Police Captain to our neighborhood. Update from Harvard on September 22 night football game. Yami Foods, Glennville Ave. Extension of hours. Rugg Road/Penniman St. - Update on Development proposal. We haven't seen the details of the "Special Review Procedure" yet, but the press release has some very positive news. Harvard is funding professional assistance that will be a great help. For the purpose of that public comment process, the Special Review Procedure establishes a Citizens Advisory Committee, consisting of the City of Boston’s Harvard Allston Task Force and several additional members to be named by the Secretary. In addition, Harvard has agreed to provide financial resources to allow the CAC to retain professional expertise for the purpose of reviewing technical planning documents on issues pertaining to transportation, energy, and air quality produced through the Special Review Procedure. Today Secretary Bowles published a Draft Record of Decision (DROD) on Harvard's waiver request. This starts a comment period that ends on October 9 for comments on this draft decision. These comments are read and considered and should specifically address items in the DROD. Probably the most relevant issue for many of us in the community is the requirement that Harvard must provide more information about the transportation data and assumptions for the Science Complex. On this subject there is an important mistake in the Secretary's findings that should be mentioned in our comments. On Page 7 of the DROD it mentions Harvard's intentions to "reduce the employee automobile mode share for the Science Complex from the current 59% at the existing Allston campus to 50%." But the automobile mode share at the existing Allston campus is 72%, not 59% (see Table 3-11 on page 3-60 of the DPIR). 59% is the overall number for all workers in Allston for all employers. The public transportation numbers are similar for all of Allston and Harvard's Allston employees, but while 23% of Allston employees bike or walk to work, only 8% of Harvard's Allston employees bike or walk. For Harvard to get only 1/2 of its Science Complex employees to drive to work, Harvard thinks they can get more of their Science Complex employees to take the T to work at the Science Complex (40%) than Harvard's Cambridge employees (39%). Considering that Cambridge has better access to the T than North Allston and Harvard Square is a true hub of public transportation (as shown by this MBTA map) it seems likely that at least a few people who might use public transportation to get to work in Cambridge will decide to drive to work in Allston. The document describing the "Special Review Procedure" has not been posted to the MEPA website yet. It needs to be signed by Harvard before it is distributed which is why it will come along a bit later than the other two documents. The Massachusetts Turnpike Authority Board today voted to postpone a vote on toll hikes citing a desire to exhaust efforts to track down cost savings first. For Mass Pike drivers, a significant toll increase is inevitable by January 2008. Today’s vote was set to focus only on tolls on the Metropolitan Highway System, which encompasses toll booths inside Route 128 at Weston and Allston, and at the Sumner and Ted Williams Tunnels. The toll increase could be as little as 25 cents at Allston and Weston, where it is currently $1, and 50 cents at the tunnels, where drivers pay $3. The Fishing Academy is a local non-profit that does great programs for our kids and introduces them to fishing and nature. They are having a fishing fundraiser on Saturday in Gloucester on the Yankee Clipper, a 75 foot deep-sea fishing boat. Please support this wonderful organization. Thanks also to the organizations sponsoring the fundraiser - New Balance, Greene Construction, Stadium Auto Body, Boston Carptenters Training Center, and Houghton Chemical. There isn't much 'news' in this story about how bands sometime disturb neighbors when they perform and practice. I found it interesting that the story quotes Jerry McDermott and refers to him as "the area's city councilor". I thought he had moved to Westwood by now so it is strange to see him giving interviews about what is happening here in A/B. For bands with a couple hundred dollars per month to spend on rehearsal space, there is The Sound Museum a Boston-based company that rents practice and recording space. They have locations in Union Sq and near Cambridge St in Allston. As an alternative, Tim McHale suggests "a community arts center that would provide space for musicians to practice outside residential neighborhoods" which is one of the many useful things that could be done with Harvard's empty buildings here in Allston and Brighton. "All Boston-area colleges need to take seriously their obligation to surrounding communities. Above all, this means recognizing the role that their students - and their own housing policies - have upon neighborhood life. Schools have leverage to keep neighborhoods like Allston from turning into "Animal House," and they ought to use it." For example, "A moderated panel discussion will investigate ways in which campuses affect, and are affected by, their contexts and communities; their mutual responsibilities in fostering urban vitality and maintaining the continuity of distinctive heritage, and as their stabilizing potential in neighborhoods and housing forces." Here are a few photos from this morning of the dismantling of the old Pepsi building, other the Science Complex related demolition, and the former Citgo station now owned by Harvard. Certainly nobody in Allston is protesting Harvard's demolition of the old Pepsi building on Western Ave. It is fine with me to see it and the other buildings around it go. None of them had any architectural charm or special value. 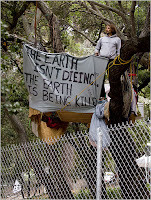 Across the country in Berkeley, CA, protesters have been living in trees for months to show their opposition for a University of California plan to to cut down the trees to build a $125 million athletic center. This happened just yards from where a bicyclist was hit by a car and killed earlier this year. I don't know who was or wasn't obeying the traffic laws but regardless this is terrible and another reminder of how unfriendly and unsafe our roads are for people using every form of transportation. Galluccio is no stranger to Harvard expansion in Cambridge. During his tenure on the city’s University Relations Committee from 2004 to 2005, Harvard secured the go-ahead for numerous construction projects, including graduate student housing near Mather House and science buildings north of the Yard. The seven-term city councillor says that his past experience will enable him to be an advocate for the Allston-Brighton area. With a $35 billion endowment, how should Harvard spend its money? "And what about the university's neighbors?" he asks, and then continues "institutions, like people, have an obligation to think about the well-being of their neighbors, and that goes double for the well-off." The people who live in Allston absolutely think about the well-being of their neighbors. But it is important to recognize the difference between how neighbors in Allston and Brighton can help each other and how it works elsewhere. It seems pretty well established that Boston and Massachusetts don't have the money to provide many of the services and amenities that are important to many people who live here. To fill this void, organizations have been created to raise money and make improvements that otherwise would not happen. The Esplande Association is a great example. Founded in 2001, The Esplanade Association has done wonderful things for the Charles River alongside the Back Bay neighborhood. In 2005 they had revenue of $455,000 that was able to support their good deeds. The Esplanade Association isn't alone in being able to raise a significant amount of money from private sources. Also in 2005 the Neighborhood Association of the Back Bay had $256,000 of revenue and the Friends of the Public Garden brought in $1.8 million dollars. So these three neighborhood groups had combined revenues of more than two and 1/2 million dollars, and I am sure there are many others with smaller but still significant operations. It is wonderful that many people are so generous and giving of their time to make these organizations as capable as they are. In a more working-class neighborhood like Allston and Brighton, we don't have many neighbors with the resources of a Chris Gabrieli who can make major contributions to local good causes. If the Allston Civic Association or Brighton Allston Improvement Association asked people to pay a membership fee, I doubt they would bother with a $1000 Sponsor level. We can keep writing and talking about the "double" obligation of the "well-off" to think about their neighbors, but something has to change at City Hall or Harvard Yard before we are going to see any results. If you wish to express an opinion about these zoning variances you can call 617-635-4775 for more information or write to: Board of Appeal, 1010 Massachusetts Avenue, 4th floor Boston, MA 02118. The hearing is at 9:30 in room 801 at City Hall. If he is offered the job, John Palmieri, who has worked in Hartford for three and a half years, would replace Mark Maloney, who left as director of the city's planning and development agency early this year. Galluccio wins state Senate seat vacated by Barrios - The Boston Globe - A complete tally of unofficial results compiled by Galluccio campaign workers, showed he led Flaherty 4,388 to 2,232. No Republicans were on the ballot yesterday, so Galluccio will run unopposed in a special general election scheduled for Oct. 9. The Harvard Crimson :: Opinion :: Will Harvard Lead In Allston? The Harvard Crimson publishes some of my thoughts about Harvard's expansion into Allston in today's paper. Mark is having a campaign rally on Friday from 7-10 at the Elks Lodge, 326 Washington St. You can call 617 789 4693 for more info. Harvard announced at last night's Task Force meeting that they have completed their purchase of the 1/2 acre of land at 182 Western Ave, the former CITGO station that has been closed for several months. The deed dated August 29 is less than transparent. It tells us that for $1 the property was transfered to "Keystone Corner LLC" at 500 Western Ave.
As the map shows, Harvard continues to tighten its grip. I happened to have a camera with me yesterday when walking down North Harvard St at 8:45 in the morning. The traffic was barely moving and jammed solid from Cambridge St to Western Ave. How much worse will it be when Harvard starts construction or eventually when 1000's of new people start commuting to jobs in North Allston? When we start talking about Harvard's 20-year plan there needs to be some serious planning to eliminate problems like this. A group of Allston and Brighton residents have put together a response to Harvard's education portal (an education community benefit) that was proposed by Harvard in mid-August. Many people think that Harvard's proposal is insufficient and signatures are being collected from community education leaders, neighbors, etc for a university-assisted community school approach. The principals of the Thomas Gardner Elementary School and German International School in North Allston and more than 100 residents and educators in the community have already pledged their support. Click here to read the letter and learn how you can support the effort. On Wednesday I went to a house party on Windom St for Tim Flaherty, one of the candidates to replace Jarrett Barrios and represent parts of Allston/Brighton in the State Senate. He talked about a typical set of issues - education, Harvard's expansion, public safety, preventing drug abuse - and in some cases I felt went a bit too far in what he told us he would do as a State Senator. Certainly as one of 40 people in the Senate you can do some good things, but I don't know how one senator is going to create drug treatment centers or solve the problem of Oxycontin abuse. As far as I know, Tim is the only one of the four candidates who has come to our neighborhood for any personal events. They are all stuffing our mailboxes with lots of postcards, but actually showing up here and talking to people is much more important than just sending us mail. Here are a few of the letters that have already been sent. You can send yours to briony.angus@state.ma.us. excerpted in the new issue of 02138, the mighty molecular biologist says "nothing may have distinguished Summers' time in office like leaving it." Give credit to Alex Selvig for being the first Allston/Brighton City Council candidate to submit and publish comments about the Harvard expansion in this letter to the State's environmental regulators in the MEPA office. We need a lot more than a councilor who sits quietly in the back of the auditorium during our community meetings. Hopefully Alex, Mark, Tim, Rosie, Greg, and James will write to the BRA by Monday and share with all of us their opinions about Harvard's proposal. Shown in green in this map, it is probably one of the world's most irregular legislative districts. But for a bunch of us in Allston and Brighton it is our State Senate district. There is a special election on September 11 to replace Jarrett Barrios and the Globe has endorsed Tim Flaherty. To find out if you can vote in this election, go to the Secretary of State's website. If it lists Barrios as your "Senate in General Court" district representative then please vote on the 11th. "He says he will fight to ensure that North Allston neighborhoods won't be "overrun" while Harvard University rolls out its ambitious campus expansion plans." What to write the BRA? A week from today is the deadline for comments to the BRA about Harvard's Science Complex. What should you write? Anything! If you don't want to write about technical issues like automobile mode share or groundwater levels, write about how you feel about the relationship between Harvard and our community. Write about the Task Force, the Task Force meetings, or the BRA. Are you satisfied, frustrated, confident, overwhelmed, or something else? Our written comments form the official summary of the past several months of meetings and that is very important. Spoken comments at meetings are good too, but those are often not recorded in the minutes and they leave no permanent record. Even if you write just a few sentences, please write! As a reminder of what we have written in the past, the community submitted these comments about the Science Complex in December 2006 and these comments in February 2007 about projects including the Science Complex in Harvard's Master Plan Amendment. Send your comments to Gerald.Autler.bra@cityofboston.gov. Maybe Jackson Pollock didn't actually paint them, but the "Pollock Matters" show opened yesterday at BC's McMullen Museum of Art. I mentioned the Boston Health Care and Research Training Institute in a post last year and it is worth mentioning again now. This profile and this website describe a great program for Boston residents living near the Longwood Medical Area. It provides entry-level workers with education and support so they can build skills, earn higher wages, and advance in their career in the health care industry. I am baffled that between the City (which funds this Longwood program and lists it on the BRA website), Task Force (whose members have talked at length about creating job opportunities for Allston/Brighton residents at Harvard's Science Complex), and Harvard (who is a "proud member" of the Institute in Longwood), we have not been able to agree on a similar program here in our neighborhood. In the Science Complex DPIR, Harvard "offers to complement the BRA Jobs and Adult Education programs by developing a workforce development program with the City" which sounds great, but what kind of program will it be? Who will fund it? How many people will be able to enroll? Do we want at least preliminary answers to these questions before the project is approved or should we just wait and see? This sort of thing can almost give the impression that Harvard isn't concerned with public opinion about the Science Complex. Because it seems so easy, when the program that we want and that makes so much sense already exists just a few miles away, for Harvard to announce that they will expand the Boston Health Care and Research Training Institute and bring this program here for Allston and Brighton residents. Maybe Harvard could even find a couple thousand square feet in the Science Complex to house the program's offices and classrooms. People would stand up and applaud, the Science Complex would enjoy greater community support, and the whole review process would feel like it was yielding something worthwhile for the community. Instead there is a vague "offer" (which is much weaker than saying "Harvard will develop a workforce development program") and little attention given to this important subject, and that is too bad.